Becoming more common over the tour, the band once again begins with exploring some open space, on this 2nd night in the Fox Theater, before finding the Oscillation groove — but they don’t even stay there for long, oddly enough, before they morph into Macha … oooh, that was REAL nice! … and they keep going into slightly more energized-than-usual LCTDT(P) — there seems to be something in the Colorado air on this night … Think is a stand alone groove before the guys decide to play Worms instead of and possibly followed by another tune I couldn’t quite hear in their onstage chatter — this recording sounds AWESOME — but Worms, one of the band’s WACKIEST grooves, wiggles its way into the space groove of Friday Afternoon In The Universe, which is an always welcome time. A solid (surprise, surprise) Bass Solo > Chubb Sub closes the set. 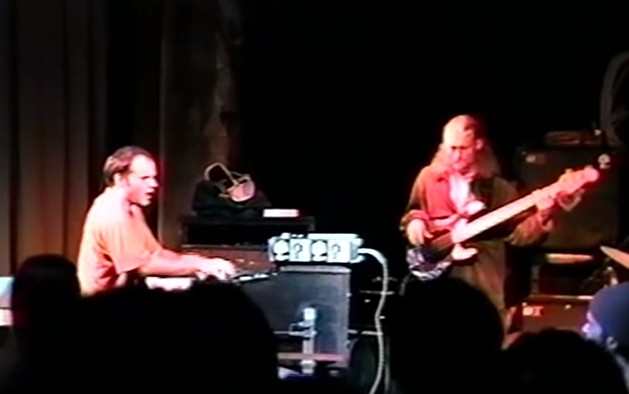 Medeski kicks up the 2nd set with an Organ Intro into Jelly Belly, Chris and Billy jump in to get the groove going while John still milks that organ and starts playing … something! Anybody recognize that melody? Hmmm … then the Jelly hits the Belly and we’re into the tune’s big groove. Bubblehouse brings down the house! ’96 bubbles are VERY intense to my ears! The band is LOCKED! So nice to hear Pakalolo in the set — they need to bring that tune back! “It’s an herb, we like to smoke.” Goodbye Porkpie Hat, sans vocal interruption, is REALLY smooth to listen to, with John showcasing his gospel organ chops while Chris and Billy hold the groove in a deep and delicsious manner. Then Crosstown Traffic takes us home to close the set. Is that Battle Hymn of the Republic at the beginning of Jelly Belly?